When I spent some time with Jeff & Liz Gordon at the recently concluded Camp Colorado I asked how the new ABA Duck Stamp sales program was going. They said they were selling droves of ’em (maybe we’ll get an update on how many once the dust settles from the big move to Delaware) which I think is awesome news. So for the hundreds & hundreds of you who have a spanking new Canvasback stamp, how about proudly displaying your support of the program by sporting it on your binocular strap? One way to do this is via a little plastic keychain picture frame the size of a duck stamp. I first tried this years ago through the Wisconsin Society for Ornithology’s duck stamp sales program, where they offer said frame for an extra three bucks. I’ve also found the equivalent on Amazon. These are pretty simple & should be checked every so often to see if the snap-in cover is working loose or if the connecting loop is wearing out. 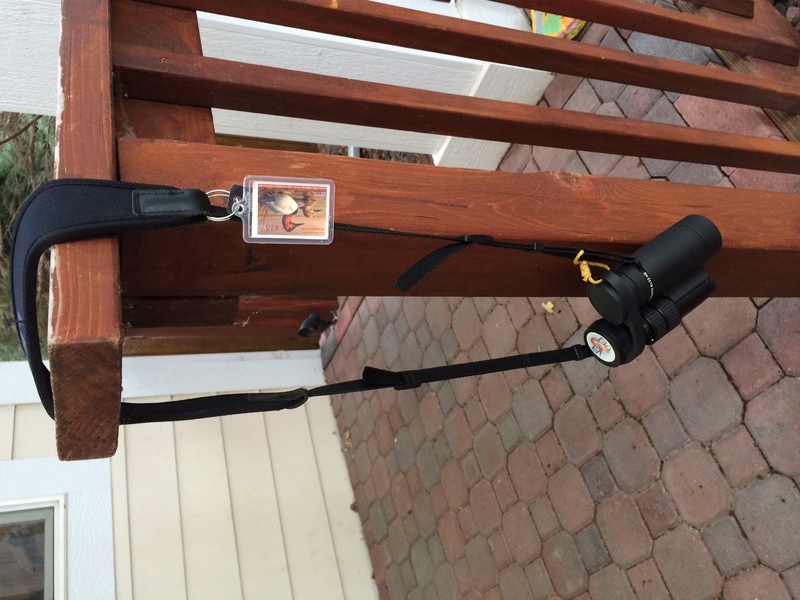 A plastic keychain photo frame is ideal for showing off your duck stamp in the field! While I’m on the topic of accessorizing your optics, I found a really cool binocular holder at my friendly neighborhood REI store the other day. It also features a human rump rest and forearm shelves. 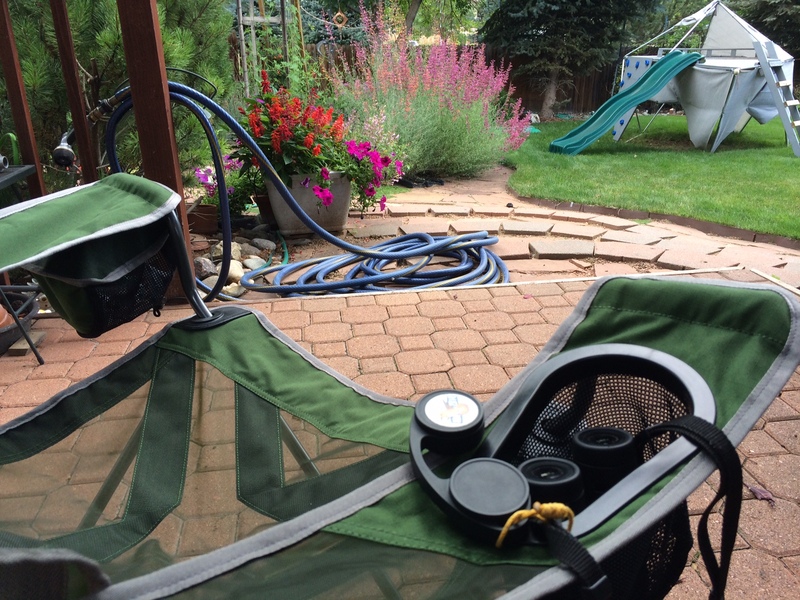 REI’s Camp-X chair conveniently holds a pair of full-sized binoculars in its oversized cup holder. I had blown out an old camp chair and serendipitously got REI’s Camp-X chair as a replacement. It turns out that the oversized beverage holder on the right arm easily accommodates my 8x32s or 8x42s in addition to the array of containers it was designed for. (“Versatile integrated cup holder on the right armrest accommodates a wide variety of container shapes and sizes, from mugs to plastic bottles to long-neck glass bottles.”) Pretty ideal for hummingbird watching, long stakeouts, big sits, multitasking at your kid’s soccer game or company BBQ (after all it’s always a good time to tick birds), etc. UPDATE: Folks- Liz Gordon kindly let me know that you can get your duck stamp display holder right from the ABA store for just two bucks, free shipping!! Don’t know how I managed to miss that option above but appreciate the easy, affordable option that the ABA provides. So update your links, get your duck stamp if you still need to, & display it proudly. Thanks for your support!